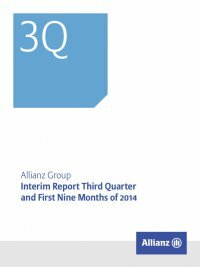 Interim Report Third Quarter and First Nine Months of 2014 Allianz Group56 The following table presents the impacts of the implementation of IFRS 10 on the consolidated balance sheet as of 31 December 2013. CHANGE OF CONSOLIDATED BALANCE SHEET as of 31 December 2013 RELATING TO the implementation of IFRS 10 € mn as of 31 December 2013 As previously reported Adoption of IFRS 10 As reported Financial assets carried at fair value through income 7,245 (585) 6,660 Investments 411,015 133 411,148 Total assets 711,530 (452) 711,079 Other liabilities 36,883 (452) 36,431 Total liabilities 658,682 (452) 658,230 Total liabilities and equity 711,530 (452) 711,079 The adoption of IFRS 10 required the additional consolidation of cer- tain investment funds where the ­Allianz Group has the ability to direct the relevant asset management activities without having a majority investment. In contrast, numerous third-party managed investment funds in which the ­Allianz Group has invested were deconsolidated to the extent that the ­Allianz Group cannot exercise power. Furthermore, IFRS 10 led to the deconsolidation of certain investment funds which mainly hold assets related to unit-linked contracts because investment decisions over these assets are not in the discretion of the ­Allianz Group. In total, these changes in the scope of consolidation led to a reduction of the balance sheet total of € 452 mn as of the date IFRS 10 was adopted. Theimpactoftheadoptionof IFRS10ontheconsolidatedincome statements, the consolidated statements of comprehensive income, the consolidated statements of changes in equity and the consoli- dated statements of cash flows is immaterial. IFRS 11, Joint Arrangements, superseded IAS 31, Interests in Joint Ventures, and SIC-13, Jointly Controlled Entities – Non-Monetary Con- tributionsbyVentures.TheIFRSrequiresapartytoajointarrangement to determine the type of joint arrangement in which it is involved by assessing its rights and obligations arising from the arrangement. The IFRS classifies joint arrangements into two types: joint operations and joint ventures. For joint operations the reporting entity has to recognize and measure the assets and liabilities (and recognize the related revenues and expenses) in relation to its interest in the arrangement in accordance with relevant IFRSs applicable to the par- ticular assets, liabilities, revenues and expenses. In contrast, for joint 3 – Consolidation significant acquisition Part of Property-Casualty insurance business of UnipolSai Assicurazioni S.p.A., Bologna Effective 1 July 2014, the ­Allianz Group acquired specific distribution activities of the Property-Casualty insurance business of UnipolSai Assicurazioni S.p.A., Bologna (“Distribution Activities”). The acquired Distribution Activities include, inter alia, a network of 725 agencies and 470 employees. At year-end 2014, the ­Allianz Group expects to purchase the Property-Casualty insurance in-force portfolio man- aged by the transferred agencies (“Portfolio”). The transfer of the Portfolio is subject to the approval by the Italian insurance regulator Istituto per la Vigilanza sulle Assicurazioni (IVASS). The acquired business represents insurance activities with premiums equal to approximately € 1.1 bn (for the year 2013). The acquired Distribution Activities together with the Portfolio give the ­Allianz Group the unique opportunity to further increase its share in a key profitable market. ventures the reporting entity has to recognize an investment and to account for that investment using the equity method in accordance with IAS 28. The application of IFRS 11 had no material impact on the financial position and the financial results of the ­Allianz Group. The revised version of IAS 28, Investments in Associates and Joint Ventures, superseded the former IAS 28, Investments in Associates. It defines ‘significant influence’, provides guidance on the application of the equity method of accounting and describes how impairment is assessed in associates and joint ventures. The adoption of the revised version of IAS 28 had no material impact on the financial posi- tion and financial results of the ­Allianz Group. IFRS 12, Disclosure of Interests in Other Entities, contains disclo- sure requirements previously set out in IASs 27, 28 and 31. Further- more, the new standard includes disclosure requirements regarding interests in unconsolidated structured entities. The disclosure requirements defined by IFRS 12 are initially to be presented in the Annual Report 2014. Other reclassifications Certain prior-period amounts have been reclassified to conform to the current period presentation.